Figure 15.16. 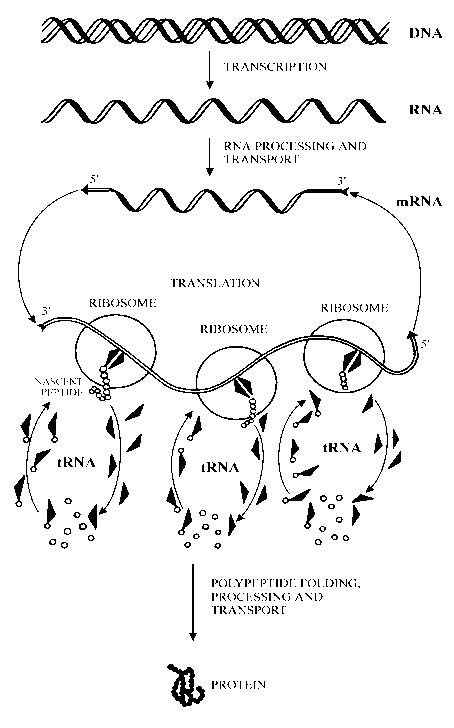 Sequence of events during initiation of translation in Eukaryotes: the model of the initiating 40S ribosomal subunit with pre-bound initiation factors. The consecutive steps from (1) to (6) are explained in the text. initiator AUG codon in the initiation complex. Step 4. The 48S initiation complex formed joins the 60S ribosomal subunit. The process is promoted by eIF5 which seems to react with the 48S complex first and induce the hydrolysis of the eIF2-bound GTP. The GDP-form of eIF2, as well as other initiation factors, are released from the 40S subunit, and the 80S initiation particle with Met-tRNAi in the P site is assembled at the initiation codon of mRNA (Fig. 15.16).